Donna Meyer, right, executive director of the Delaware County Historical Society, accepts the donation of a portrait of Judge Hosea Williams from Louise Warner, founder and board member of the Stratford Ecological Center. Warner is a descendant of Williams. The portrait will hang in the Historical Society’s Meeker Homestead Museum. Supporters of the Stratford Ecological Center and Delaware County Historical Society celebrated a shared heritage and a homecoming of sorts this week. 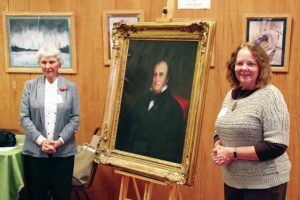 Stratford founder and board member Louise Warner donated a portrait of her ancestor, Judge Hosea Williams, to the Historical Society during a luncheon held Wednesday at the ecological center. Warner is the great-great-granddaughter of Williams, whose first name she said was pronounced “hoh-zee” by his contemporaries in 19th Century Delaware County. Historical Society Executive Director Donna Meyer said the portrait of Judge Hosea Williams will be displayed in the Meeker Homestead Museum, located at 2690 Stratford Road. “Because of his connection to Stratford, this seems like a natural place for him,” Meyer said. “When I became aware of this portrait — of course, I love anything historic — I was like, ‘Oh, he should come home to Stratford,’” Meyer said. “When David contacted me and said Dr. Warner was going to give this us, I was so thrilled. I had the privilege of learning a little about Hosea Williams — what a remarkable man. “You should be very proud to come from such strong community leaders as these folks,” Meyer said to Warner during the presentation. Warner said American painter and sculptor William Walcutt painted the portrait of Judge Williams in 1856. Walcutt, Meyer noted, is best remembered for the marble Commodore Oliver Hazard Perry Monument (1860), currently displayed inside the visitor center at the Perry’s Victory and International Peace Memorial in Put-in-Bay, Ohio. A native of Berkshire County, Massachusetts, Williams was born in 1792 and moved to Delaware County in 1817, purchasing a 300-acre farm two miles west of Delaware. In 1825, Williams moved his family to Delaware (northeast corner of Winter and Washington streets) and lived in town where he embarked in mercantile business and became a community leader. He was elected a county commissioner and became the first president of the Delaware County branch of the State Bank of Ohio in 1845, which later became the Delaware County National Bank. Along with Judge Caleb Howard, he purchased the woolen and gristmills at Stratford from Forrest Meeker in 1838 and converted them to a paper mill. This mill on the “Whetstone River” (now the Olentangy) had an undershot water wheel that provided power and turned the presses. Operations began Oct. 1, 1839. The mill burned two years later, but was rebuilt. Williams also contributed materials for building the small stone millworkers’ homes at Stratford as well as the Stratford Methodist Church, which was dedicated July 4, 1844. He was a member of the first board of directors of the Cleveland, Columbus, and Cincinnati Railroad. Williams was called judge due to the fact that before the present judicial system was adopted, a common pleas judge had two associate judges sit with him. They were not necessarily familiar with the law, but saw to it that justice was done, while the actual judge supplied the legal knowledge.